Beginning with Marco Polo’s admiration of their artistry, exotic beauty and sumptuous quality, antique Turkish rugs have been one of the most desired works of art by both rug and art collectors since the 13th century. Glowing with remarkable patterns, vividly rich colors and fascinating motifs, antique Turkish rugs continue to be revered as historical icons of a time when vast empires ruled the land, Ottoman sultans lived incredibly wealthy lives and the remarkable talent of Turkish rug makers produced some of the most magnificent rugs the world has ever seen. 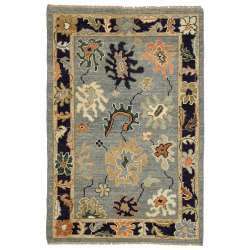 Included in our selection of antique Turkish rugs for sale are Kilims, Oushaks and Sivas rugs. Appreciated for their superior weaving technique and grand patterns, Sivas rugs typically present Persian influences involving medallions and all-over designs incorporating vine scrolls and palmettes. Palettes of Sivas rugs emphasize pastel hues and ivory tones complementing detailed motifs and images, making them the perfect decorative touch for elegant, formal interiors. Turkish rugs made during the time of Marco Polo are known as Seljuk rugs. Eventually discovered in mosques several centuries later lying under layers of carpets, Turkish Seljuk rugs were once commissioned by the royal courts and exported to neighboring countries for trade or sale. Turkish rug making reached its apex during the Ottoman Empire when the designs began resembling Anatolian rugs and carpets. The rugs in Esmaili’s antique Turkish rugs collection are made mostly from wool, but they occasionally have cotton or silk enhancements. The collection features a dazzling array of Turkish rugs bursting with the colors of dyes extracted from flowers, vegetable roots and even insects. From the brilliantly illustrated motifs indicative of Eastern Anatolian rugs to the serenely soft palette of Turkish Oushaks, our antique Turkish rugs continue to delight and inspire clients from all over the world. We have Turkish rugs woven during every exciting period of Turkish history, from Kazaks and Yazdaks to Kilims, Turkestans and Sumaks. You won’t find a more comprehensive, stunning selection of antique Turkish rugs online than the selection we offer at Esmaili’s Rugs and Antiques. Our antique Turkish rug experts would be more than happy to answer any questions you have about the fabulous Turkish rugs included in our collection. We always love hearing from antique rug enthusiasts, interior designers, architects or anyone searching for the perfect complement to a particular area ambience. Contact us online today or call us at 214-651-7847.